From the time construction began in 2004 to today, Arizona Broadway Theatre has taken great care to create a beautiful, versatile performance space that allows for every type of theatrical production, special event, and musical extravaganza. ABT’s art-deco-inspired lobby can accommodate up to 300 patrons, and the space layout varies based on the event being held (e.g. ; auction, casino, dance floor, etc.). A fully-stocked bar is available during each show for a pre-show or intermission cocktail. ABT’s main stage performance space includes a 6,300 square-foot house with table seating for 470 patrons, and every seat in the house has an unobstructed view of the stage. The 40-foot-wide proscenium-style stage includes 2,700 square feet of performance space, with an additional 700 square feet of wing space. The apron of the stage can be fully or partially removed to expose an orchestra pit with room for up to 12 musicians. The single purchase fly system, located stage right, includes 16 line sets (4 line sets are dedicated for electrics) with a max load of 1,000 lbs. Just off the lobby is ABT’s Encore Room, a 6000-square-foot space, available for special events, private parties, awards ceremonies, etc. Lighting – The lighting inventory of over 200 fixtures includes both conventional and moving lights and is controlled by an ETC Ion light board. Sound – The sound inventory includes various wired and wireless microphones, instrument microphones, stage monitors, front-of-house speakers, subs and wired and wireless communication headsets. The soundboard is a Yamaha M7CL digital console. Projection – The projection inventory includes 2 fixed front-of-house projectors (4,000 Lumens) and 1 F/R projector (6,000 Lumens). 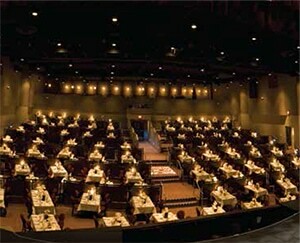 ABT’s balcony section is also available for large party or private group rental, up to 40 patrons. Each patron receives tableside service from a full menu of delicious meals. The menu changes for each show, themed towards the production itself (e.g., South Pacific – Asian Cuisine, Big River – Cajun Cuisine). The 3,000-square-foot kitchen can accommodate 3 events simultaneously, and employs 12 cooks, 5 stewards, and 45 service employees. ABT also offers catering services to events outside of the theater. For the current show menu, CLICK HERE. Many of ABT’s collection of event items are also available for rental. For more information regarding the renting of any of ABT’s facilities or for a full list of rental items, please CLICK HERE.